As recently as August 7, the Phillies were in first place and 15 games over .500. Since then, they’ve gone an NL-worst 14-28, while the Braves have gone 27-19. Very obviously, when a team collapses, several components have to be involved. One thing I’ll highlight, though: dating back to August 8, according to Baseball Savant, Phillies pitchers have ranked seventh in baseball in expected wOBA allowed, while Braves pitchers have ranked 16th. And yet, Phillies pitchers have ranked 26th in baseball in actual wOBA allowed, while Braves pitchers have ranked third. Call it noise if you want. I’m certain that’s a part of it. The other part is defense. The Phillies’ team defense has let them down, and as the headline suggests, they’re on the verge of establishing a new record. There are three teams in there from this season alone. Maybe that’s worth talking about another day. But for now, just focus on the Phillies. It’s true that this season isn’t yet over. In theory, the Phillies might not end up in last place. Yet they have just seven games left, and they’re already nine runs worse than the 2005 Yankees. The chances of the Phillies making up that ground are exceptionally slim. They’d be exceptionally slim if the Phillies had a good defense, and, well, they don’t. That’s what the table is showing you. In any worthwhile article about defense, be it about individuals or teams, one has to mention the caveats. No, we can’t measure defense precisely. No, the formulas haven’t remained consistent and identical over the past decade and a half. Yes, this era of non-traditional defensive alignment has made things ever more complicated. And even just at FanGraphs, there’s also UZR. 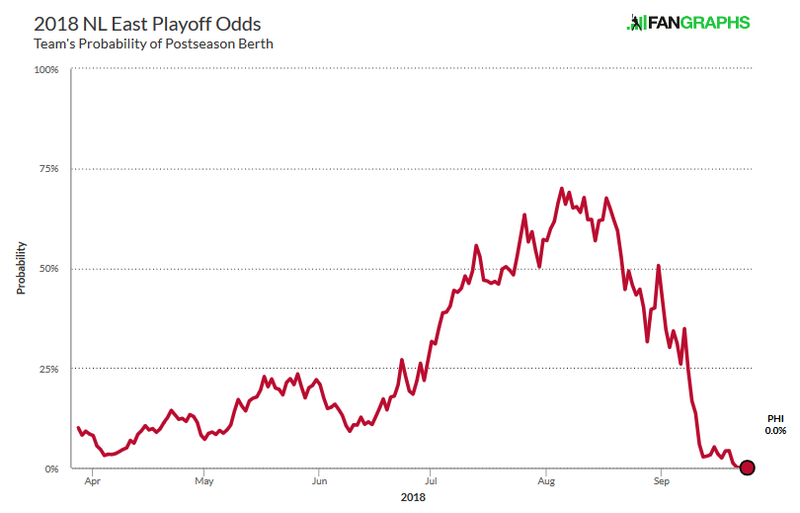 UZR thinks this year’s Phillies have been very bad, but not exactly record-level bad. That’s worth something, too. 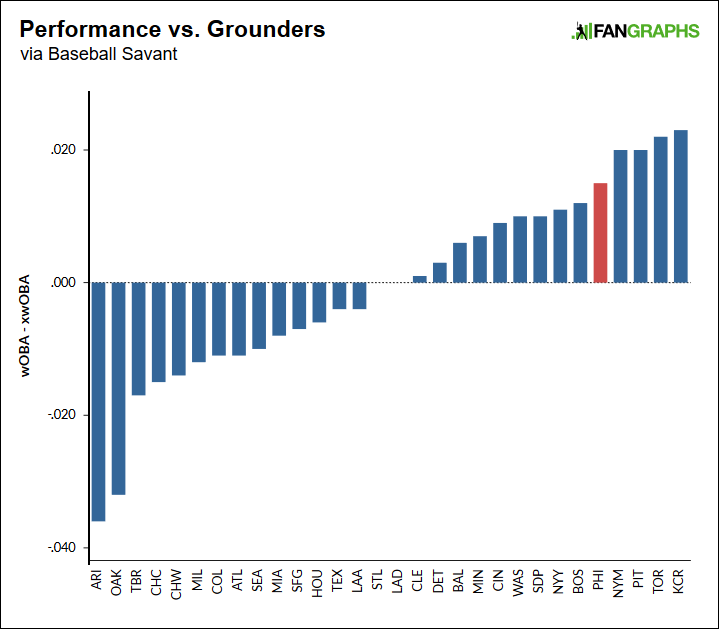 There’s not nearly enough evidence to say the Phillies have absolutely had the worst team defense in a very long time. But there is *some* evidence. There is DRS. I didn’t make up those numbers, and they didn’t make up those numbers. There’s no reason for them to have a bias. And it should be clear that, at the very least, the Phillies’ defense has been a season-long weakness. The team has acknowledged it time and time again. Just for fun, let’s run through the Phillies’ various positional ranks. There are, of course, 30 teams. According to UZR, the Phillies have had almost the worst defense in baseball. Yet UZR doesn’t have information for pitchers or catchers. There are just zeroes. When you look at DRS, you see that the Phillies rank poorly in both areas. No team’s pitchers have been worse, while the catchers have also combined to be a problem. It’s totally fair to question the latter, since the numbers at Baseball Prospectus think the Phillies’ catchers have been slightly above-average, but I led with DRS, so that’s the main focus. Whatever the Phillies have done right, DRS hasn’t seen it. The Phillies don’t look good, again, and this particular metric doesn’t consider outfield arms. This is just about range. Range is the most important component, absolutely, but arms matter, too, and the Phillies’ outfield arms, collectively, rank in the bottom five by both DRS and UZR. In other words, they’ve been even worse than just Outs Above Average would indicate. The infield has been a problem, and the outfield has been a problem, and when the both of those are problems, it can be a lot to overcome. Doesn’t mean it’s a death sentence; sometimes teams happily concede defense for offense. And yet Phillies non-pitchers have a combined wRC+ of just 98, which is two points below average. The Phillies knew they’d be sacrificing some defense this season. You’ll recall they were the team that, in spring training, experimented with swapping left and right fielders based on the handedness of the hitter. For a while, the Phillies made it work, but ultimately, they just didn’t get enough in return for the sacrifice. With a defense so bad, you need to be able to hit. The Phillies haven’t done enough hitting, and so they’ll go into the offseason looking to make a major splash. In retrospect, you could say the story of the 2018 Phillies is represented by the acquisition of Carlos Santana. Santana looked to be a fine hitter, and so the Phillies made room by bumping Rhys Hoskins to the corner outfield. At the time, the Phillies told themselves Santana was too good of a deal to pass up. But Santana hasn’t quite been that effective at the plate, while Hoskins, in the field, has been a massive liability. Nothing has been catastrophic. Santana’s been a useful first baseman, and Hoskins has been a useful left fielder. But, knowing what they know now, the Phillies presumably wouldn’t choose to repeat this. It’s something for them to figure out moving forward, assuming they don’t figure Hoskins’ range will improve. Overall, things have worked out okay, but they haven’t worked out well enough to win, and win consistently. The Phillies gambled on a suboptimal alignment. In one sense, the offseason might be easy. The Phillies might just land Manny Machado or Bryce Harper, and then they’ll have a better lineup. They’ll have a roster good enough to hang around. Yet there’s a chance that doesn’t happen, and, even if it does, there are defensive improvements worth thinking about. There are studies to run, to see if maybe the team could improve its positioning. The Phillies will need to evaluate whether they already have the right personnel. Defense, in 2018, was the ballclub’s biggest detriment. Next year’s going to come with greater expectations. We hoped you liked reading The Worst DRS We’ve Ever Seen by Jeff Sullivan! Still got a ways to go to enter the “stars who really shouldn’t be playing that position anymore” division. Torres at SS and Andujar at 3B is the worst left side of an infield (defensively) since Yuniesky Betancourt and Wilson Betemit for the 2010 Royals. Historically the Royals system has an uncanny ability to produce terrible shortstops. I don’t remember the exact number but like 4 or 5 of the worst SS seasons ever have come from the Royals in the past 15 years. I thought it would be about Gleyber Torres. But Gleyber, at least, gets to balls for the most part. Just can’t field ’em. Torres has always been considered a plus defender, he just needs some seasoning (he’s also new to 2B). Andujar, not so much. Right now he has hands of stone and sometimes looks like he either doesn’t know what he’s doing or isn’t trying. Could be the new position. In a way it feels similar to Devers’ struggles–he has the tools but the execution is lacking. So he’s always been considered a plus defender, but Davenport’s numbers have never loved him. He’s always been about average. Still, even then the tools are there. It’s weird to think that he couldn’t handle 2B. Let’s not forget he’s 21 years old. I’m older than him, and I can barely catch the TV remote when my roommate tosses it to me (from a couple of feet away mind you lol). Robinson Cano made 26 errors in his first two seasons, and he too was a positively-regarded shortstop in the minors. I worry about Andujar’s long-term outlook, but Gleyber? Gleyber will be fine. DEVERS has 23 errors to Andujar’s 15 in 200 fewer innings. Be honest, please. For once (anyone who mjakes a comment like that has a problem with it). Sorry, the RF variance is not enough to claim 1) Devers is better (certainly not offensively) and 2) Andujar has the “worst DRS Evah”, as you suggest. Sheesh! 32 friggin’ upvotes. My word, honesty is in short frickin’ supply around here. What a weak comeback. Nobody talks about errors. Errors are discssued every freakin’ game. Pretty sure they’re mentioned in this article. People are still citing fielding percentage and what the hell is that based on? Meanwhile I NEVER hear ANY ringing endorsements for DRS or UZR. Even this article gives a huge nod to the great caveat that must be uttered when serious people meet to discuss these advanced metrics. So spare me. More dishonesty parading as insight. 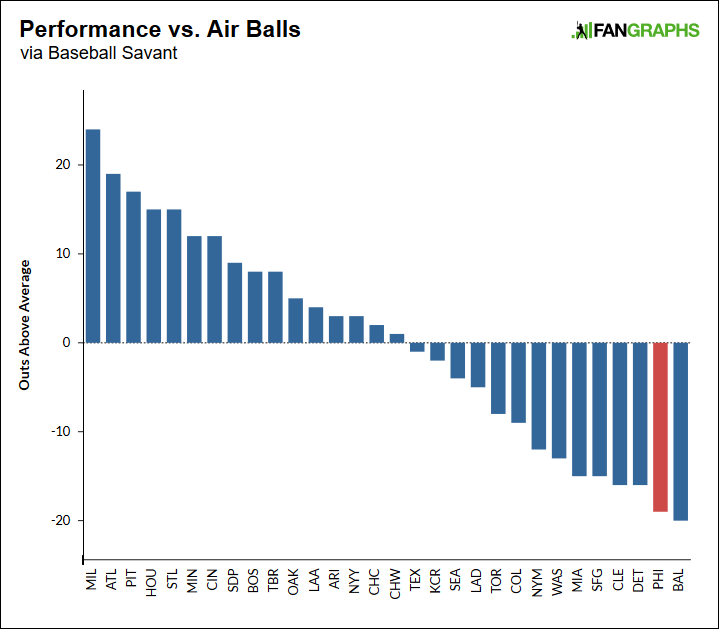 Do you…do you not read fangraphs? I don’t care about what the knuckle dragging announcers talk about. They talk about batting average and RBI, too, which are easy to discuss in the casual context of a game broadcast, but they are obviously not a good measure of a player’s full contribution to the game (even their full contribution to the offense). There’s broad consensus that errors are not a reasonable method of measuring a player’s complete defensive contribution and DRS and UZR (for any of their failings) are superior methods of measuring overall defensive contribution, particularly when reviewed together. I didn’t say Andujar was better, I was just establishing 1) they are comparable yet seymour singled out Andujar, 2) that’s intellectually dishonest. The irony is that Andujar is definitely the better player this year, and perhaps in the future too. But while he looks bad Devers is definitely the better fielder, and it isn’t even close. Andujar probably needs to be moved to a different corner, because he is an absolute butcher at third. Dude. Go back to PFT. This blend of rage-judging isn’t welcome here. So let me see: Wins will not factor into a Cy for Snell, assuming he gets it. Mookie’s BA will not be considered in his MVP, assuming he beats JDM. And JDM’s 124 RBI will mean absolutely nothing in an MVP conversation. Check. Check. Check. Thanks for setting me straight. The point is that Devers is not much better than Andujar and therefore the remark about Andujar and the worst DRS is garbage. The point should really be that Andujar’s not all that close to having the worst DRS of the last five years…he’s not even in the top five. Hell, he doesn’t even have 2018’s worst DRS!